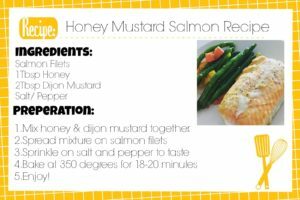 So one of my FAVORITE go to dinners for when I am running errands all day and don’t feel like cooking up a storm (or standing over a stove) is this DELISH Honey Mustard Salmon recipe!! 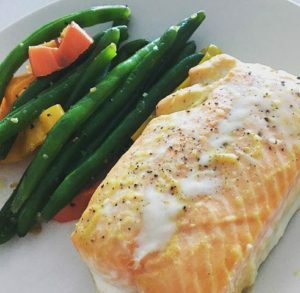 The beauty of this dish is that if you are super busy and have kids running around or still have work emails to catch up on or even need to still fit your workout in for the day-this is a recipe that you can whip up in about 5 minutes, pop in the oven and get back to work (or whatever it is you need to get to)! And you know what, sometimes its just great to be able to pop a dish in the oven and not have to stand over the oven for 25 minutes waiting for it to cook! You just prepare the marinade, brush on and pop in the oven!! VIOLA!! Dinner is ready 20 minutes later!! So I encourage you to use this dish as your SECRET WEAPON!! Take some more time for yourself and just wait until that timer goes over to plate and EAT!! Let me know if you try this recipe and how you like it!! REMEMBER: This is your secret weapon to conquering the dinner craze and fitting in a few extra minutes for you…errr, whatever else you need to get done!! BON APPETITE! !